This is what miners in Kalgoorlie call the baby truck. This one took a break from its 24/7 duty in the super pit to take part in the annual parade. The only reason its big brother did not make an appearance this year was it could not fit under the new power lines across the main street. 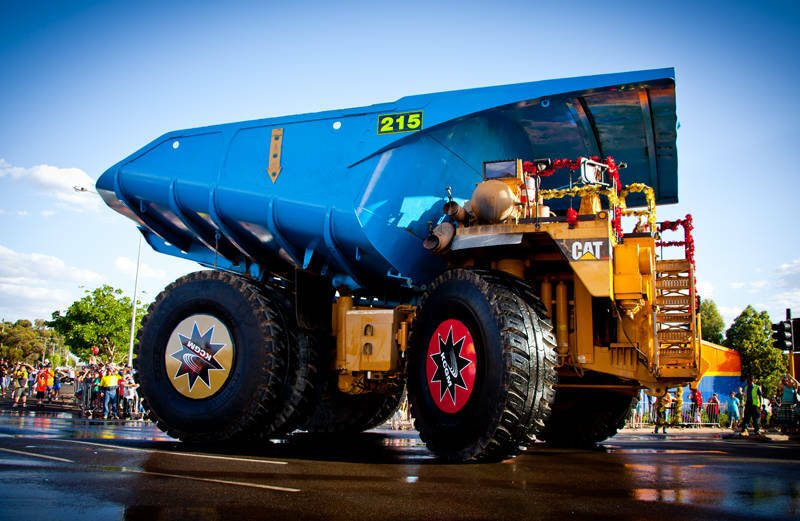 There are 40 trucks like this each carrying 220 tonnes of rock with an average of 2g of gold per tonne. The drivers of these truck can earn £1000/day and they are always looking new drivers. The 500 meter deep Super pit at the edge of town has only recently restarted digging since the rise in the gold price has made it economically viable again. We spent an enjoyable 4 days in Kalgoorlie. We met some prospectors and have seen more nuggets of gold than you could imagine. We are now deep in the gold fields at a place called Niagara Dam. We had a close encounter with two Brumbies today and Karen also saw her first willy-willy this afternoon which she described as a perfect mini tornado about 6 foot tall and very loud. Tomorrow we head for Leonora. Are you specializing in big machine photography now? I think the technique needs a proper name. Mechanography – the photography of mechanisms large and small. Mechanography, I like it. Australia does have lot of big mechanical stuff.